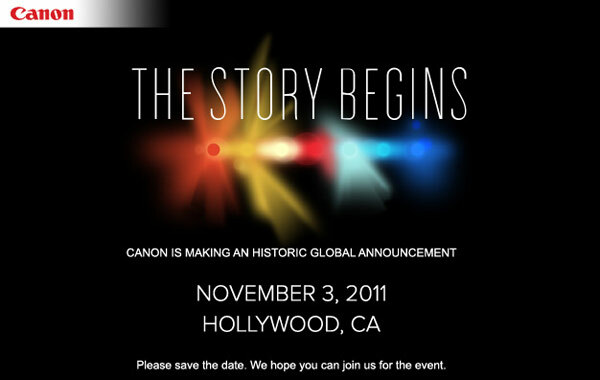 My Chicano Lawyer.com: Canon making an "historic" announcement on November 3rd! Canon making an "historic" announcement on November 3rd! Canon has recently released an announcement about an announcement on November 3rd. With a little luck, it will be something more than an official announcement about another announcement. It's been almost 3 years since the 5D Mark II was released and everyone is waiting to see what's next. My money is on a cinema camera that will destroy RED on price point and features. Of course in the pompous department, RED will never lose. So why does this announcement to an announcement warrant a post by a Chicano Lawyer? Well, many friends come to me about photography advice. Which camera should I buy, what lens should I steal, etc.? Given this recent announcement, the answer is clear. None. Wait. Whatever Canon announces, it definitely justifies waiting until Nov. 3rd to see what the Japanese have up their sleeves. Until this announcement, I was seriously considering getting the Sony NEX-5n. It's Sony's new camera that shoots 24P AND 60P in 1080P. It also does this in virtual darkness. Check out www.EOSHD.com for a full review. As tempting as the NEX-5n looks, I'm waiting. Canon made me a fan-boy 2 years ago with the 5D Mark II and 1D Mark IV. They can do it again. Come on Canon, make me drool.